To understand Ares Kingdom, one has to telegraph not only the band’s intentions in the present day but also their formative influences. 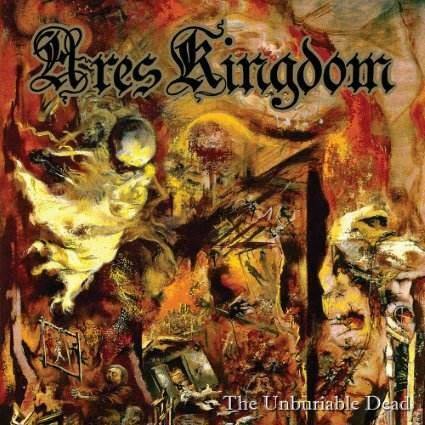 Ares Kingdom‘s sound is built on a foundation of 80s underground death/thrash as performed by the likes of Sacrifice, Slaughter Lord, and Pentagram (Chile). To those familiar with such names, this was a vicious, take-no-prisoners slant on the speed metal of that era, containing all the incentives and all the caveats that one might reasonably expect from that style: energy in the moment versus a gratuitousness borne of that same approach to songwriting. It is one of the most natural of dichotomies to be found in all metal subgenres, and one that has rendered thrash metal virtually obsolete over time. Ares Kingdom‘s experiment has been to fuse this energy of their forebears with the epic vibes of old heavy metal. But while the former influences are easy enough to pinpoint, the heavy metal component in the band’s quiver of stylings is harder to isolate, and to all appearances is of their very own making. The mistake many make in evaluating this band is of focusing solely on individual technique; closer attention, however, reveals a songcraft aided by unity of theme. Ares Kingdom‘s musical palette consists of certain fixed colors, but within those colors are contained many subtle hues; this band’s skill lies in creating a consummate mix of these hues without sounding a dissonant note. This is far more crucial than might appear initially, because without expertise in tasteful variation, this style of metal would be declared dead on arrival. Judging metal based on the context in which it is birthed and the lineage which it lays claim to is of great importance. It has to be said, however, that as much objective scrutiny as Ares Kingdom‘s music is capable of standing up to, it ultimately delegates the weighing of its virtues to indescribable, elemental truths of this genre. The Unburiable Dead is rousing, heroic music that has to be heard rather than listened to. It contains all of the things said above, and it deviates little from the template created on Return To Dust and Incendiary; there is a more pronounced nod to core melody, perhaps, and tempos vary with greater regularity within songs themselves as opposed to earlier work where distinctive moods were allocated to individual pieces. But these are minor asides. Ares Kingdom have remained true to themselves and to heavy metal. The Unburiable Dead, like previous albums, will require multiple listens to begin asserting itself, but it will be regarded as an essential addition to this critical band’s discography. This entry was posted in Uncategorized and tagged Ares Kingdom, Death/thrash, Incendiary, Pentagram Chile, Return To Dust, Sacrifice, The Unburiable Dead. Bookmark the permalink.